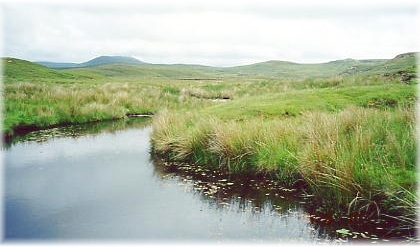 Auna and Shanakeever are two glacial valley lakes located north of Clifden. Up into the mid-20th century Shanakeever claimed a few homes overlooking the lake but as of late only one family continues to reside above it. A significant number of sightings have been recorded from these two otherwise modest sized bodies of water; the majority of which were documented by F. W. Holiday in the 60s whereas additional accounts have been recorded in the past few years by Gary Cunningham and the author. Much of what's come to light has been through the cooperation of Tom Joyce, a longtime resident of Shanakeever. Growing up, Mr. Joyce often heard locals speak of the "horse-eels" but it wasn't until 1963 when he himself watched a large hump coursing through Lough Shanakeever before finally terminating in a patch of reeds. His fascination crystallized, Joyce was keen to any other stories or sightings had by friends and neighbors alike. When the Loch Ness Investigation Bureau arrived in 1968, Tom Joyce proved a most valuable ally in being able to introduce the crew to locals he knew of who'd had past sightings. Because of Mr. Joyce's personal interest and cooperation a number of intriguing and revealing observations of these mysterious creatures have been documented. In all his years living above Lough Shanakeever and farming along neighboring Lough Auna, Mr. Joyce has only identified three instances he would refer to as "genuine" sightings. The were other times, he noted, where something unusual was observed but not substantial enough to conclude a horse-eel was for certain involved. Growing up near the lake Joyce had heard of numerous stories and accounts that passed around about folks spotting the occasional "horse-eel". Some, perhaps many, came to take co-existence with these strange animals for granted but Joyce seems to have held the matter with special interest. In all his years living above Lough Shanakeever and farming along neighboring Lough Auna, Mr. Joyce cites only three incidences he refers to as "genuine" sightings. Implying that there was undoubted certainty that what he observed was a horse-eel. There had been other moments, he notes, where peculiar disturbances were observed but nothing substantial enough to identify with the creatures. Tom Joyce's first "genuine" sighting transpired in 1963. He had been guiding sheep to the farmyard when a commotion broke out upon the otherwise calm surface of the lake. Coming away from the shore before curving slightly parallel to it was a large grayish hump, "sparkling" in the sunlight, with a length of seven or eight feet and around two feet in height. The object entered a patch of reeds where its larger submerged dimensions crushed over the plants as it went along before finally sinking below. Almost two decades would pass before Joyce would again see a horse-eel again. In 1980 he was attending a BBQ at a cottage on Lough Auna when a number of guests noticed a strange swimming animal. (See below). Mr. Joyce's most recent sighting occurred in June of 1982. While driving along the lake with a German visitor Tom barely caught sight of an abstract projection in the water near shore. Joyce explained that it took him a second to realize that the shape was not a normal part of the scenery. He raced back to his home to fetch his camera but the object had since vanished. There had been additional moments in all his years along the lake where Joyce had noticed disturbances or unusual commotions in the water but as nothing came to surface he deemed them as inconclusive. However, one particular instance stands out as memorable. At one point during the 1960s the lough actually froze over; a rare event in itself. While outside with a friend a banging noise was heard coming from beneath the frozen surface which was proceeded an upheaval of spray and chunks of ice. Something presumably alive had burst through but even with the aid of a rifle scope the force responsible couldn't be seen in time. During the Loch Ness Investigation Bureau's time in Clifden Tom Joyce told Ted Holiday to visit with Patrick Canning regarding his experience. Canning was a former soldier who had worked at the local convent until 1958. One rainy morning in either 1944 or 1945, while on his way to work Canning made his way down to Lough Shanakeever to retrieve his pregnant mare. The mare had been resting along the stream pouring out of Shanakeever. Canning claimed that once he'd reached an estimated distance of 200 yards the donkey stood up, revealing the presence of a black animal circling from behind. Immediately he assumed it was none other than the longer awaited foal, apparently circling its mother in wanting to nurse. He hastened his step, concerned the newborn may wander too close to the bank. However, as Canning was approaching the "foal" detected him and immediately dove into the stream and disappeared from sight. The mare, as it turned out, was still bearing. The mare and the unidentified creature seen by Patrick Canning had been on the rise pictured at the right. Most likely the animal had been passing through the stream when it spotted the donkey. During his interview by Holiday, Patrick Canning noted that at the time he had thought the foal was a bit bigger than normal and in reflection the body had struck him as somewhat elongated. The neck in particular, he noted, was longer than would be expected. He had thought he'd seen ears on its head as well as legs (considering he mistook the creature for a foal in the first place, it's probable such features were assumed by default). The animal's motions as it circled the mare were described as "gentle". Canning was familiar with the horse-eel, at very least the local lore surrounding it, and concluded after the event that that was what he'd seen. Patrick Walsh was upon Lough Shanakeever in a row-boat when the head and neck and a creature surfaced nearby. Afraid it would capsize his boat, he immediately rowed to shore. Patrick knew of two men who had gone down to the shore in order to inspect an unusual object near land when it came to life and swam off. They described it as eel-like and 16 feet long. During a visit in 1998 Tom told me an interesting story involving a previous neighbor on the lough. Something had been taking the man's sheep and a dog or fox was suspected. A sheep's carcass was set down by the lake shore as bait for the nocturnal varmint while the man sat up the hill wrapped in a blanket and armed with a rifle. Eventually something was heard approaching the spot where the carcass had been set though nothing could be made out even in the moonlight. Hardly able to contain himself after the long cold wait he let off a blast of the rifle with expectation that a dog or a fox would be sent scampering up the hill. However what happened next was most unexpected. In response to the shot there was a great splash as something lunged into the water. Nothing could be seen swimming away so whatever was inspecting the carcass had dived beneath the surface. The spray it created was far to great for an otter. 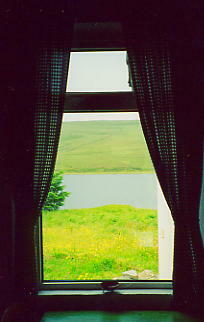 Only a single unoccupied cottage sits upon Lough Auna. 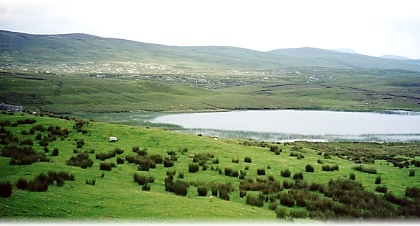 The water on the far right is Lough Shanakeever. Not all sightings happen from afar. One story Tom Joyce told Ted Holiday was something of a close encounter. Sometime in the latter part of the 19th century a Mrs. Whalen had been attending to the turf along the edge of Lough Auna during the evening when a commotion erupted in the water. Emerging from the lake and onto the shore right beside her came a horse-eel; the front half resembling a horse with the back portions tapering of like an eel. Naturally, Mrs. Whalen didn't stick around to get acquainted and immediately fled. Mr. Joyce told me that there were "many, many, many," such accounts as had by Mrs. Whalen. A man withholding his name told Holiday of a large eel-shaped creature seen by he and his mother as they were stacking peat along Lough Auna. About two hundred yards away a 30-40 ft eel-like animal could be seen rising out of the water in the shape of three or four humps. One of the humps, assumed to be the neck, sported something of a large mane that stood up as though it were a fin or composed of bristles. The creature would rise up to the surface and then roll along its side and submerge, sending waves lapping along the shore. It repeated this odd behavior, rising only to roll and sink, for around a quarter of an hour. During a summer BBQ party held at the cottage on Lough Auna a group of attendees, including Tom Joyce, were called to the attention of a strange shape coursing across the lake at a "walking pace". The object was estimated at five feet in length and about a foot in height. The curious element about this report was the unusual projections said to present along the back. Some suggested it was an otter carrying young upon its back or a large fish. However, as it was noted one of the witnesses, Air Commodore Kort of the Royal Netherlands Air Force, either of them would have left a wake as it swam. Whereas, as he would recall, "the un-canning thing about it was the gliding movement without any disturbance of the water on the surface." The oddity was watched until disappearing into a patch of reeds. Sometime after midnight in either 1984 or 1985, Tom Joyce was saying goodbye to visiting friends when a "giant of a man" came running frantically down road. The man was an off-duty Welsh soldier who had just been fly fishing up the road at Lough Auna. He explained that in the midst of fishing he'd taken notice of something in the light of the moon, like the head of an animal, floating along the surface. On top of the object were two projections, almost like eyes, which gave the impression it was watching him. Disturbed, the soldier began walking along the shore only to have object begin to move in his direction. The man hastened his step but the figure managed to match his pace until he finally broke out running. In telling Tom Joyce of what he'd seen he stated that in all his years of military service he'd never been so terrified of anything. So greatly bothered was the man that he said he wanted to file a complaint with the local fishing board! The following day Tom Joyce approached a local farmer who'd been tending to his cattle along Lough Auna. Asked if he'd noticed anything unusual, the farmer replied that the day prior while walking along the lake in search of a missing cow, a large splash occurred from within some high reeds, as though something were reacting to his approach. Thinking it may have been the cow, he reached an angle from where he could see within the weeds but nothing was there.